Join Fred Kingwill at our March Paint In for a series of fun activities to help us enjoy the “magic” of watercolors. We will focus on painting the mountains. (Fred lives in Jackson Hole at the base of the Tetons when he is not in Houston). 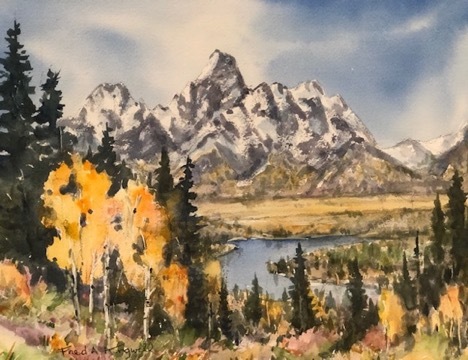 Fred has been teaching watercolors for over 40 years. We will explore basic elements of the mountain landscapes like skies, trees, water, etc. A big part of the day will focus on how to include emotions in your paintings. Bring your normal watercolor supplies, paper towels, and maybe some extra paper as we will be doing many small exercises.